Happy Thanksgiving, all! This is the time of year that we all take a moment to reflect on the things for which we are thankful. I'm thankful that I have a job that pays me to make ridiculous things. I'm also thankful that a blog post, whole and entire, found its way into my mailbox last month. This week's blog post comes from Brian Wolfe at Costume Armour Inc. I love how this project showcases the particular challenges of theater- and the amazing things that props folks can accomplish. 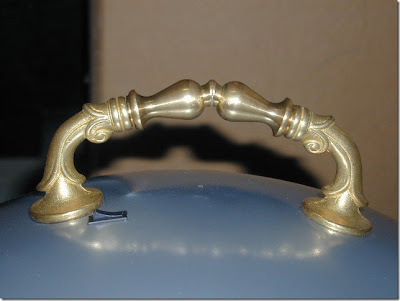 If you like what you see, I encourage you to check out more of the company's prop work here. So, without further ado, I'll turn it over to Brian. We had an interesting challenge this past summer that I thought you might like to see. The challenge: A waiter walks in with a food cart with a covered tray on top. He lifts the top to reveal a delicious roast turkey. He covers it. 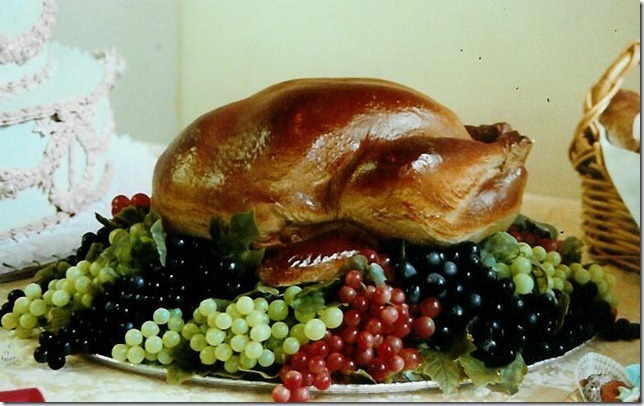 The next time it is opened by an actor and the turkey is gone and there is a speaking actor’s head on the tray. 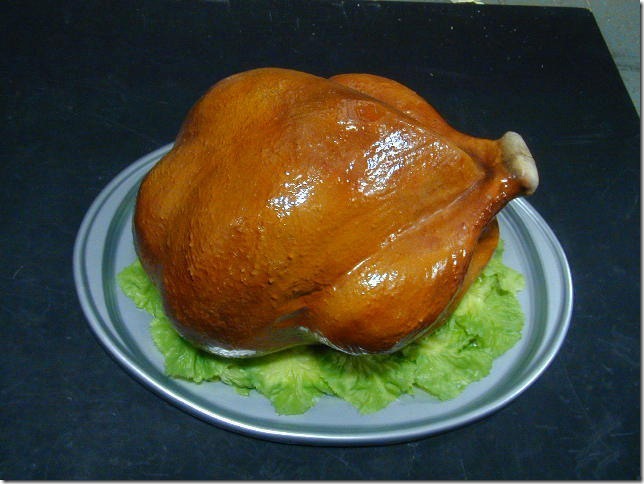 We have a turkey mold we took off a real roast turkey similar to the way Anna made her chicken pieces. We have used this mold many times, pictured here for Great Expectations. Unfortunately a human head does not fit into this 18 lb. 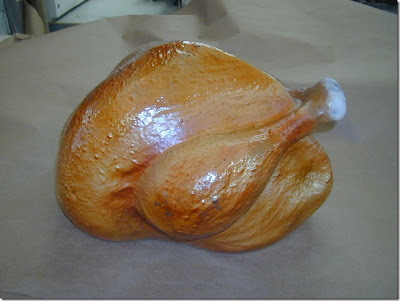 turkey and the customer wanted a cartoon styled oversized turkey. In addition a rubber turkey is pretty heavy for the magic trick. 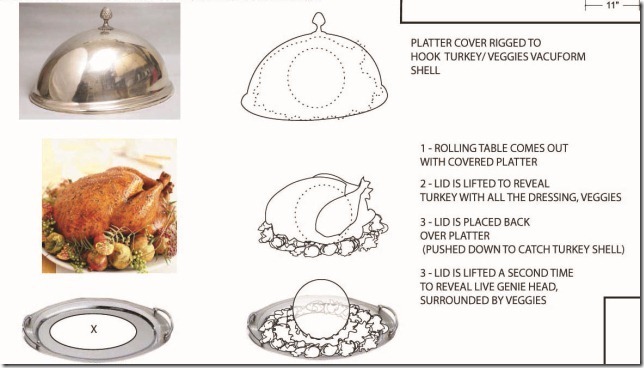 So what we did instead was opt for a very lightweight vacuum formed turkey, a vacuum formed tray in a metallic silver and an electro magnet. We carved a cartoon version of a turkey in styrofoam, split it and made it into a two piece mold which we vacuum formed in .04 Kydex plastic. The pieces are cut out, assembled and painted. 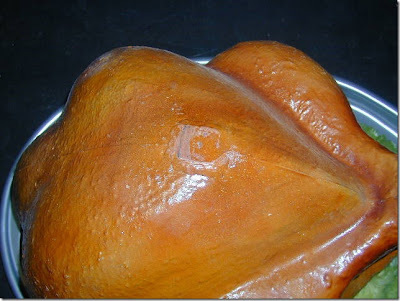 A large hole is cut in the button of the turkey. The bottom of the tray mold is made in wood and vacuum formed in a heavy metallic finished .093 Kydex plastic. 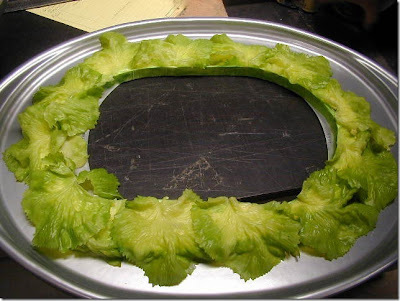 We have molds for lettuce but as in this case it is sometimes cheaper to buy and the quality of this lettuce is amazing. The hole is obviously an accommodation for the head trick. 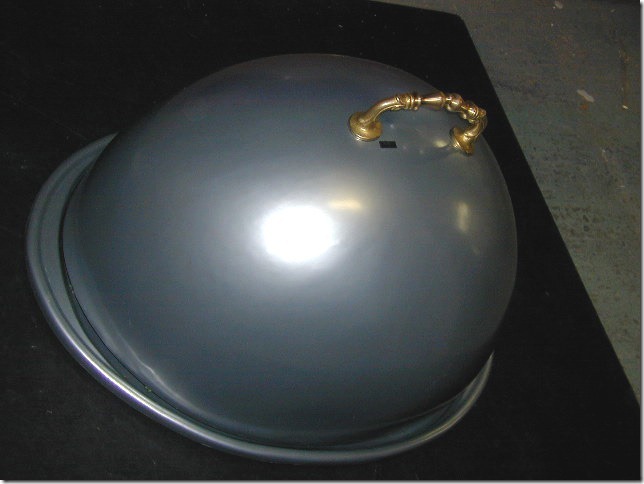 The tray top is made as a plaster mold, vacuum formed in the same metallic plastic and an added a purchased brass drawer pull finishes the lid. 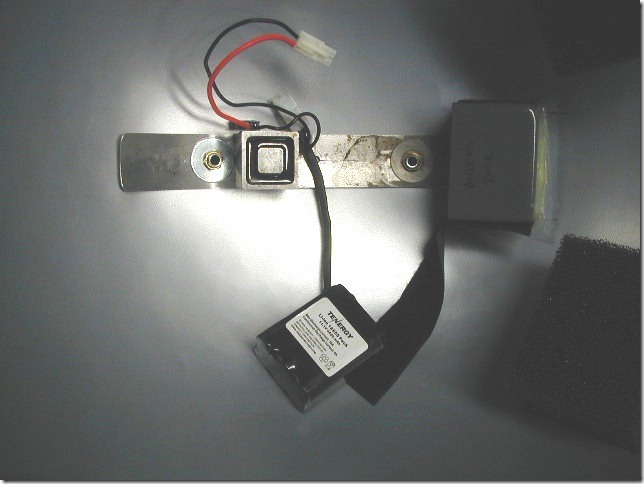 The little black rectangle next to the handle is a small toggle switch. The waiter flips the switch which turns on a battery powered electro magnet inside the lid. Inside the top of the turkey is a piece of flat steel that the magnet can grab. We had hoped to put it behind the plastic but an electro magnet has to actually touch the plate to work. 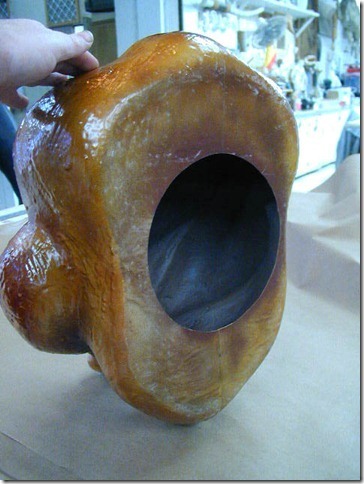 We eventually cut a hole in the turkey and inserted the steel plated and painted it to match. Open the tray and the turkey is there. 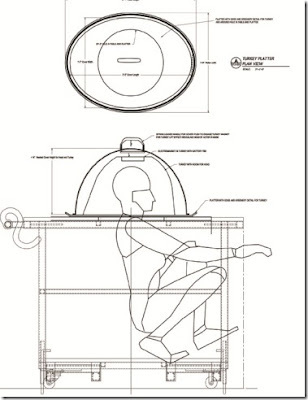 Close it, flip the switch and voila the genie’s head as the turkey stays in the lid which the waiter faces upstage.